RESISTANCE MOVEMENT. A correspondent from Nest 8 responds to the recent hit pieces by local newspaper Sörmlands nyheter (Sörmland News), and reports on Nyköping Police’s latest illegal actions and violent attack. 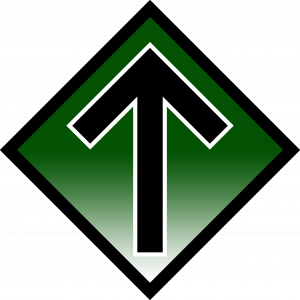 The media’s tactic of attacking the Nordic Resistance Movement to get clicks is currently being diligently employed by Sörmlands nyheter. 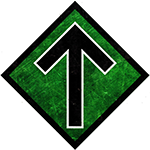 In what appears to be a marketing ploy to help their new website, the paper began publishing an unprecedented series of hit pieces on the Nordic Resistance Movement from 9 April onwards. These pieces contain everything from doxxing to astonishing statements from Södermanland’s thought police. The black propaganda campaign appears to be planned to last for several days. The first day of the hate campaign saw the lying press publish three articles. 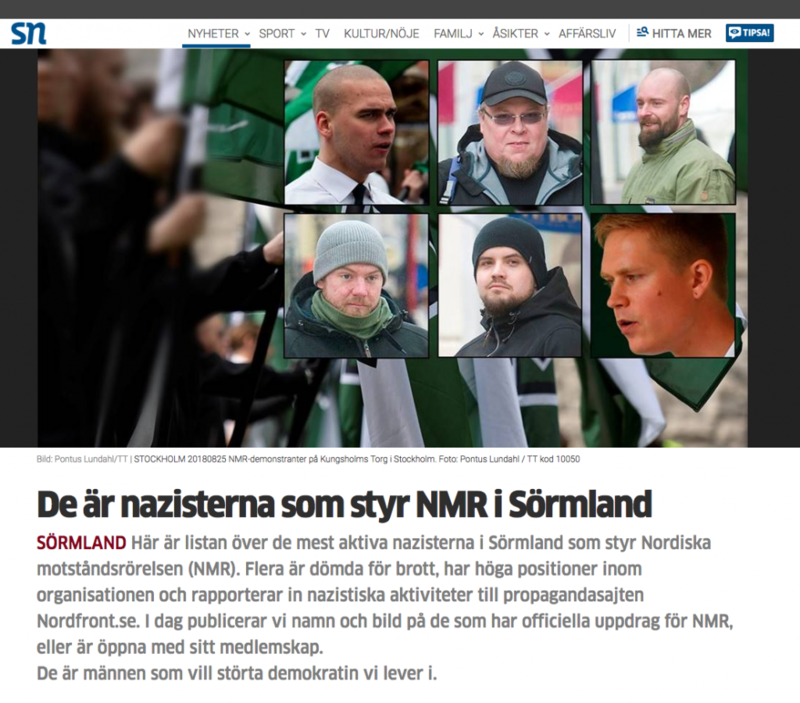 The first, titled “These are the Nazis who run the NRM in Sörmland”, was a typical doxxing article. Some Resistance men were doxxed with their names and photos, while others had only their ages and locations reported. This was presumably because the “journalists” responsible realised they could be found guilty of libel if they published the members’ full details. The article contains a series of inaccuracies, and some of the people “exposed” in it aren’t even members of the Resistance Movement. One member who had his name and photo published was falsely accused of having spread “anti-Semitism and hate against homosexuals” despite having never been reported or prosecuted for anything of the kind. The next piece was an editorial penned by the chief editor of Sörmlands media – Eva Burman – in which she expresses her fantasies about what kinds of politics the Nordic Resistance Movement stands for. Under the hypocritical headline “Where the NRM begins, democracy ends” she lies about our views and defends her attacks by claiming that liberal society does nothing to combat them. The main thread of the article is her whining that “democracy’s tool, freedom of expression” also applies to, and is used by, us. If the quote by police chief Mikael Backman published by Sörmlands Nyheter is accurate, he is breaking the law. Threatening the population with harassment by the police if they support a lawful political party is among the worst things I’ve seen. We will be taking action against this. I will also take this opportunity to address the regular policemen in Sörmland. Did you join the police to hound people with different opinions? Maybe you should consider if this is what you really want. A paradigm shift is approaching. Choose your side today. The Resistance Movement – and the members of Activist Group 801 in particular – have a long history with Sörmlands Nyheter and the (thought) police in Nyköping. The paper has doxxed members on several previous occasions and takes every opportunity to libel both individual members and the organisation itself. The newspaper’s proudest achievement was their “revelation” that National Socialists hired a training area where they practised everything from football to martial arts. In response, the anti-Swedish city council unlawfully annulled our contract, after which we decided to hold a training session outside the city hall. This ended with undercover police wearing skull and crossbones symbols attacking the training session. A detailed report of this incident can be seen here [Swedish]. Since then the police have stepped up their harassment against local members. They have targeted one person at a time, following them, regularly stopping and searching them, and so on. They have also committed blatantly illegal acts, such as seizing phones and computers without any clear suspicion of crimes. More recently the police have become utterly crazed in their behaviour. On Thursday 4 April, two Resistance Movement members were stopped by a police car on their way to a group training session. Without any justification or warning, both of them were pepper sprayed and then arrested. When the rest of the group approached the police, the police set a dog on them, which resulted in several of the activists suffering deep bite wounds. Both incidents were filmed, but the police seized the activists’ phones in order to confiscate the material. This incident will have legal consequences, and hopefully the unprovoked assault will be shown on Nordfront at some point in the future. 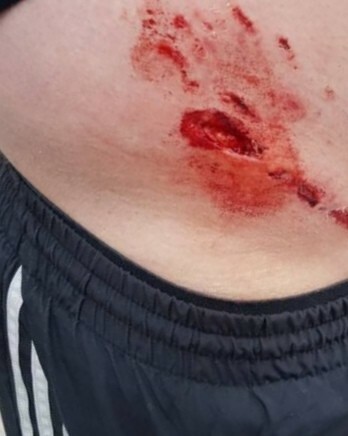 You can see a photo of one of the dog bites here (Warning: graphic image). 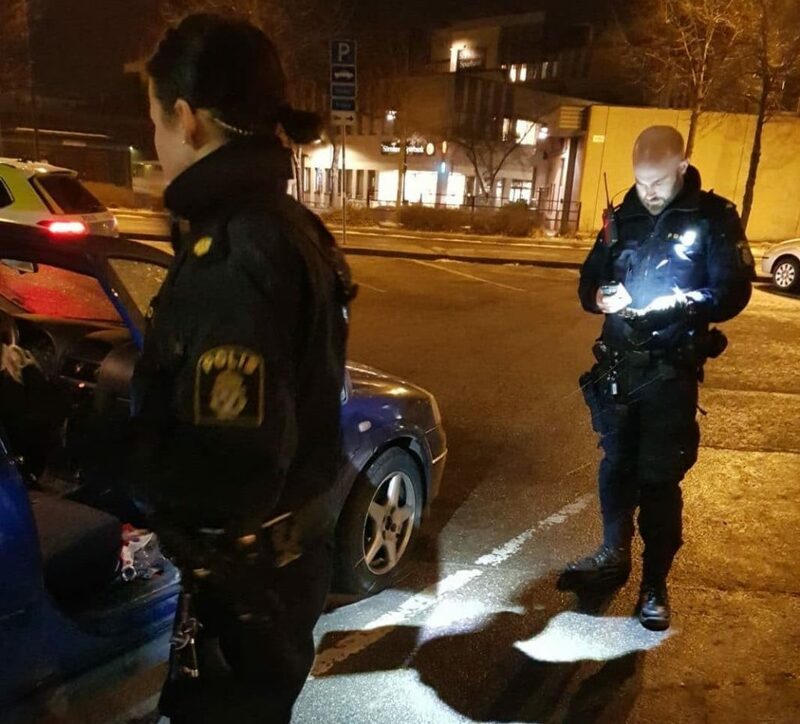 Apart from cosying up to criminal racial foreigners, it seems the police in Nyköping have no other duties outside of terrorising Resistance Movement activists. 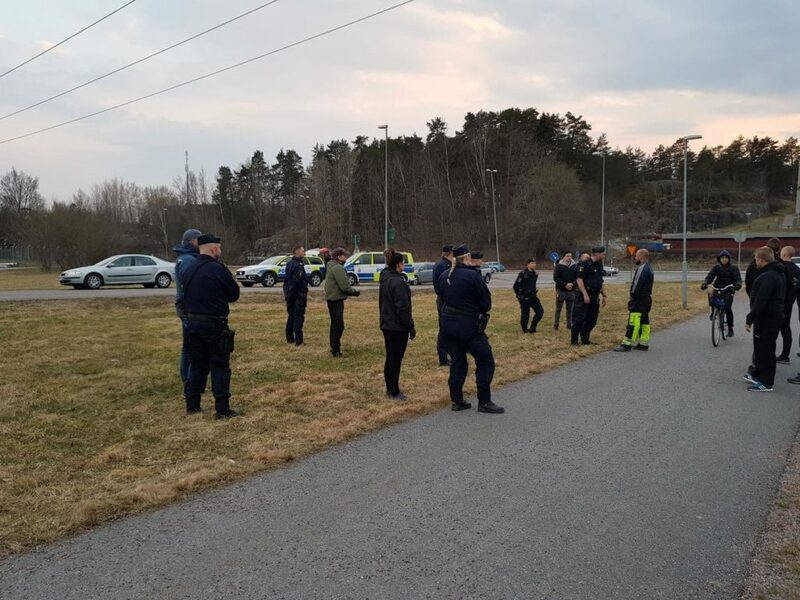 As such, everyday life for members of Activist Group 801 in Nyköping now consists of vehicle stop and searches, body searches and the police watching them outside their homes and places of work etc. Although this behaviour is aggravating, such repression proves the righteousness of our struggle. It can also be comical to see what the police do to get a reaction; for example, when they recently “seized” a plastic knife from an activist. During the time of writing this article, the police have visited another group training session and stopped another comrade for a routine check. Crimes are committed every day in Nyköping, but they are given low priority so the police can play at being political commissars. But police persecution will never stop National Socialism’s victory or our struggle, either in the long term or short term. Activist Group 801 would like to remind all our enemies in the media, political establishment and police that their actions will one day have consequences. To all our kinsmen who have not yet fought back against the increasingly oppressive system: It is time to understand that you are part of the problem. Don’t let the terrorists’ threats scare you. Find your courage and resist!